As a natural whole food, Dr. Harvey's Multi-Vitamin & Mineral Herbal Dog Supplement ensures that your dog has the vitamins and minerals she needs in her daily diet. 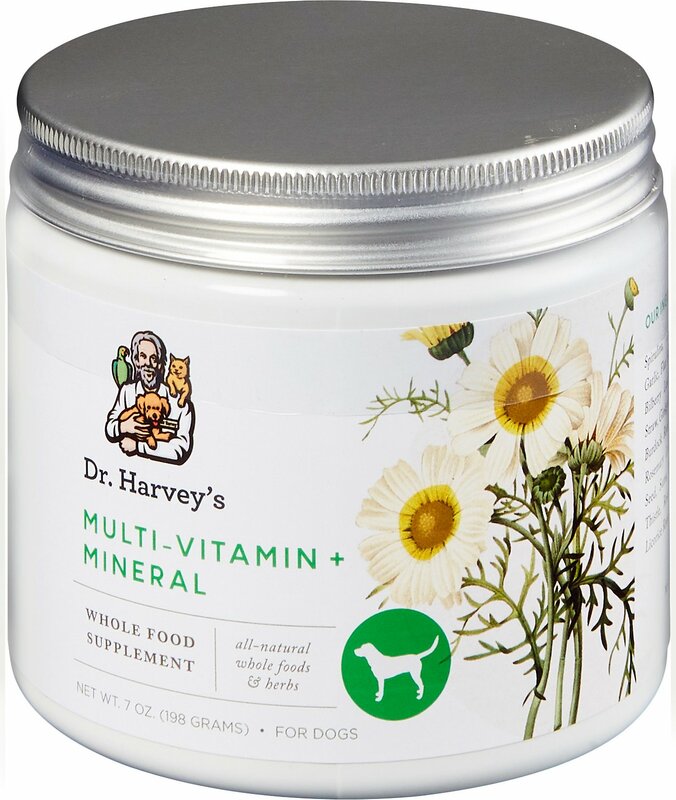 Dr. Harvey’s easy-to-use herbal powder contains all the vitamins and minerals necessary to achieve optimal wellness in your faithful companion. Dr. Harvey’s Multi-Vitamin & Mineral Herbal supplement can easily be added to an all-natural diet. Spirulina, Lecithin, Nutritional Yeast, Garlic, Flax Seed Meal, Alfalfa Leaf, Kelp, Bilberry Leaf, Chamomile Flowers, Oat Straw, Ginkgo Biloba Leaf, Dandelion Root, Burdock Root, Thyme Leaf, Papaya Leaf, Rosemary Leaf, Peppermint Leaf, Fennel Seed, Suma, Red Clover Blossoms, Milk Thistle, Rose Hips, Yellow Dock Root, Licorice Root, Ginger Root, Fo-Ti Root. We have only been using this product for about a week now. As to be expressed, we have not seen any major transformation, but also I don’t think it would be fair to assume that would be the desired outcome of this type of product. Rather, my dog loves the taste and doesn’t mind me putting it on as a topper. I bought two other additional supplements and will be reviewing those also. My pup will eat this . I sprinkle this over his food every morning. I’m glad Dr.Harvey has these products for dogs. My dog will lick right out of the container! He really likes it! My dogs like it, it mixes well with their food, and they have more energy. We have loved this product for our Great Dane Hope. It helps tremendously with her shedding. I bought a jar of the Multi, and she didn't shed at all, but when we hadn't bought it in a while she had decor pillow size balls of fur everywhere. It also has helped her keep a shine to her coat. Our Galen is allergic to most stuff on the planet, so finding a supplement that he can eat was a journey. He tolerates Dr. Harvey’s very well, and a wonderful side effect is that since he’s been eating it he has stopped eating grass after every meal! My dogs would not eat this even wrapped in meat. Any ideas? While I like all the ingredients in this product, after I purchased it, I found out that it is not approved by the NASC. Not quite sure why and I will be contacting Dr. Harvey's directly. Although I have heard good reviews of this product, I'm hesitant to give it to my dog. We bought these because we were worried about our pups digestion. These really helped ease our mind she was getting her proper nutrition, and they weren’t unpalatable for her food for our picky eater! I've had to start cooking for my bullmastiff due to a lymphoma diagnosis, this is one of the supplements I'm using to ensure she is getting balanced nutrition. So far she seems to like it.